We welcome Feisty Pants to our team of bloggers, she is living in Cheyenne and is making her time here one adventure after another. She&apos;s been gracious enough to share some of her adventures with us! Check out all of her adventures on her blog. A girl who has never met a cupcake she doesn&apos;t like and has had cupcake withdrawals since moving away from Madison, Wisconsin: aka the cupcake shop mecca of the United States. Infused Buttercream Cupcakery opened in town about two months ago and when I found out Cheyenne was finally getting a cupcake shop, I, quite literally, ran around to all of my coworkers and screamed the good news at them like a frantic Chihuahua. Hardly anyone could understand my excitement. After all, Cheyenne didn&apos;t have a cupcake shop and there are rumors that the fad of the cupcake is dead. That is absurd. 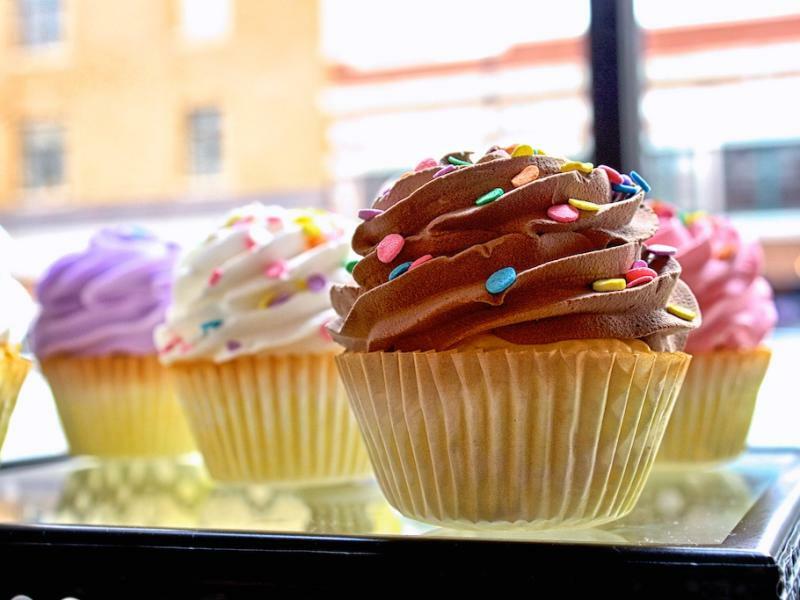 Many others balk at the idea of spending $3 on a cupcake at one of the thousands of cupcake shops across America and say the habit has become as "basic" as PSL&apos;s in the Fall and Ugg boots in the Winter. Let&apos;s not be ridiculous. This is a baked delight we have all known and loved since that first sprinkle-covered confection introduced to us at our Kindergarten best friend&apos;s birthday party. And as Taylor Swift says, "We&apos;ll never go out of style" and I think she was referring to cupcakes, not Harry Styles. I had heard mixed reviews about Infused Buttercream, but I knew, having lived next door to a cupcake shop in Madison for two years, I had to try them myself. I walked into the brick building located at 112 East 17th Street and was immediately welcomed to two-story tall ceilings, beautiful historic wood floors, platters of cupcakes in the windows, crystal chandeliers and silk flowers sprinkled around, and bright pink walls warming my hesitant heart. In the back of the expansive sun-soaked shop, you see a trio of girls decorating freshly baked cupcakes and a staircase leading to the lofted party room: a space rented for parties, meetings, and special events. A pergola-style rooftop is hung over a cupcake case offering at least a dozen varieties of cupcakes. Opposite the case are white tables made of refurbished doors and window panes and bright white chairs with bright blue seat cushions neatly placed around each table. The whole vibe gives you the feeling of being at an outdoor cafe, but in the comfort of a historic building shielding you from the infamous Wyoming winds. I met Neva, the owner, and proceeded to have a very Anna awkward moment. I didn&apos;t even introduce myself to her before exploding with excitement. But even more than that she is a go-getter and that is an inspiring energy to be around. Neva, who was born and raised in Cheyenne, worked in the health industry and began baking as a way to enjoy her free time after her husband, Adam, bought her a cupcake kit. Soon she was showering her coworkers and friends with beautifully decorated cupcakes made with whole, fresh, and organic ingredients and they encouraged her to take it one step further: open a shop. Neva told me she came to the lofty decision to open a cupcake shop in November and it only took her about two-months to see it come to fruition. How impressive is that?! How many of us have a dream we want to aspire to? How many of us actually do it? How many of us can accomplish that dream in a matter of 75-days? Think of how crazy different your life could be if you committed to pursuing something with fierce determination? Adam was Neva&apos;s most encouraging supporter as they moved forward with making plans and checking off to-do lists. In Neva&apos;s words, Adam "dreams with her". How beautiful is that?! Neva said the hardest part of opening the shop was finding a space in historic downtown Cheyenne. After looking at a few different options, they landed at their home on East 17th. Neva shares with me the unique history that the space used to be joined with the space inhabited by mattress shop next door. The two spaces are now divided and the large fireplace located in Infused Buttercream takes the place of a doorway that used to lead shoppers of the past from one section to the other. While I am still researching for the specific history of Neva&apos;s building, I did stumble across a beautiful piece of serendipity. In the late 1800&apos;s, a bake shop and confectionery was located just one block away from where Neva&apos;s shop would open up 125 years later. Ellis Bakery and Confectionery Store was located at 110 West 17th Street and was a family-business for over 25-years. Henry Ellis was born in Germany and moved to Cheyenne shortly after the town was founded. Having owned a restaurant when he lived in Wisconsin, Ellis decided to open 444 Monkies Oyster Bar restaurant where, along with their regular dinner menu, they introduced ice cream and handmade confections to the town. A few years later, the family opened Ellis Bakery and Confectionery Shop in downtown Cheyenne. The store became an extraordinarily popular destination for the women of Cheyenne and nearly 1,000 loaves of bread, along with sweets such as cakes, were sold daily during the busy Summer months. H.H. Ellis&apos; original recipe book can be found at the Wyoming State Archives and the original sign to his oyster bar hangs in the Wyoming State Museum. Much like how things would have been baked in the 1800&apos;s, Neva continues her habit of using the best natural ingredients when making her cupcakes. During our conversation she commented that she had heard reviews that her cupcakes didn&apos;t taste like the cupcakes people were used to. In a previous interview with the Wyoming Tribune Eagle, Neva says, "We don&apos;t used ingredients that we can&apos;t pronounce." So, maybe those folks are right that these cakes taste different; these cupcakes are made with thoughtful and whole ingredients. Forget the processed chocolate, Neva is using 100% cacao. After our conversation, I was set to the task of choosing a cupcake to taste. With flavors like Neopolitan, Samoas, Margarita, Heavenly Toasted Coconut, Raspberry Limoncello, Whisky + Coke, and Bananas Foster how is a girl to choose?? So, with my lack of decision-making skills, I have turned into a squirrel hoarding nuts in her cheeks in preparation for Winter. In my case, though, I am squirreling away three cupcakes placed in individual Tupperware containers throughout my purse. For the record: I chose the Samoas cupcake, the Classy Vanilla with sprinkles, and the Raspberry Limoncello and all three were DELICIOUS!